The organ of the church in Santa Maria of Campagna in Piacenza (Saint Mary of Campagna located in Piacenza, Italy) was manufactured by the Serassi Brothers from Bergamo in two periods (1825 and 1838) under the supervision of Father Davide from Bergamo, the organist of the church and a noted composer of the period ("Padre Davide da Bergamo"). 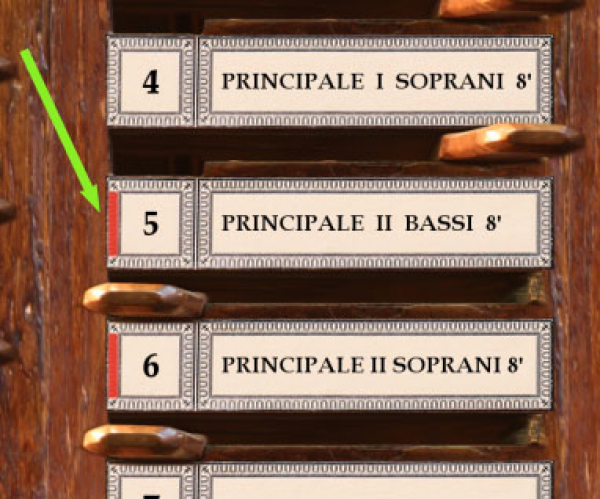 This organ is one of the most important Italian instruments due both to the fame of its makers (Serassi was the most popular manufacturer of organs in that period) as well as for the stop disposition and sound characteristics specifically wanted by Padre Davide. It fully reflects the orchestral taste of Italian organ music in the 1800s. Thanks to the Serassi Brothers (and to Bossi, their rival/colleagues), beginning in the mid 1700s the small Italian organ started to gain an enrichment from new sounds intended to imitate instruments in the orchestra: the transverse flute (or Flutta), the English horn, the hunting horns, the trumpet, the bassoon, the piccolo, the cello, etc. To these pipe sounds were also added percussion effects like timpani, bells, and the bass drum (Turkish band). All this additional color was obtained even while leaving the general dimensions quite small, especially if compared to contemporaneous organs outside Italy. This efficiency was accomplished due to the extensive use of "half registers." These stops did not play on the full keyboard, but only in the bass or treble half. 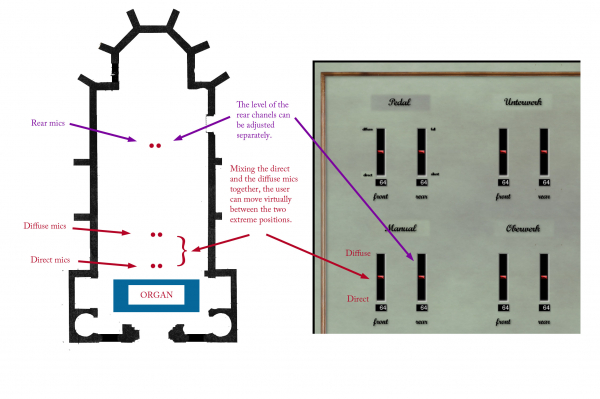 In this way, pipe space was saved by offering to the organist the the use of two different registers simultaneously in the left and right hands. The total effect was remarkably evocative of a real orchestra or band. On the organ it was therefore possible to play not only the religious repertoire for services but also secular pieces, ranging from orchestral to theatrical music, including sonatas, symphonies, and other freely-composed pieces. Italian music written for use in the liturgy (offertories, elevations, post-communion voluntaries, and versets) changed in style, becoming more brilliant and virtuosic. The organist was no longer a "mere servant" of the liturgy but instead became virtuoso: a concert player in the modern sense. 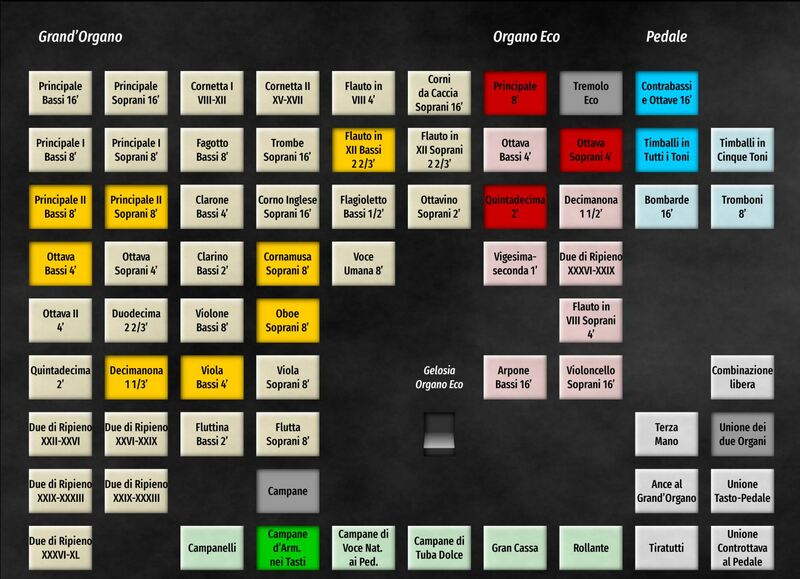 In this process of organ and musical evolution, Padre Davide from Bergamo played a fundamental role. Padre Davide was born in Zanica (just south of Bergamo) on January 21, 1791, under the name of Felice Moretti. He began organ study in 1806 with Davide Bianchi and continued later with Antonio Gonzales. He took composition lessons from Johann Simon Mayr. He was organist in various locations near Bergamo (Torre Boldone, Zanica, and Gandino). On July 25, 1818, Padre Davide took religious orders and joined the minor friars convent of S. Maria di Campagna in Piacenza, where he stayed for 45 years until his death in 1863. During these years, Padre Davide wrote a large quantity of organ and vocal music (for the chorus of the friars of the basilica). He was highly sought-after throughout Italy to play for the dedications of new organs and was a true concert player, the first organist in a period that saw many virtuosi on other instruments (Viotti, Paganini, Bazzini, Bottesini, Carulli, Sivori). His activity was very intense: hundreds of concerts and active participation in numerous organ projects as a performer and consultant. 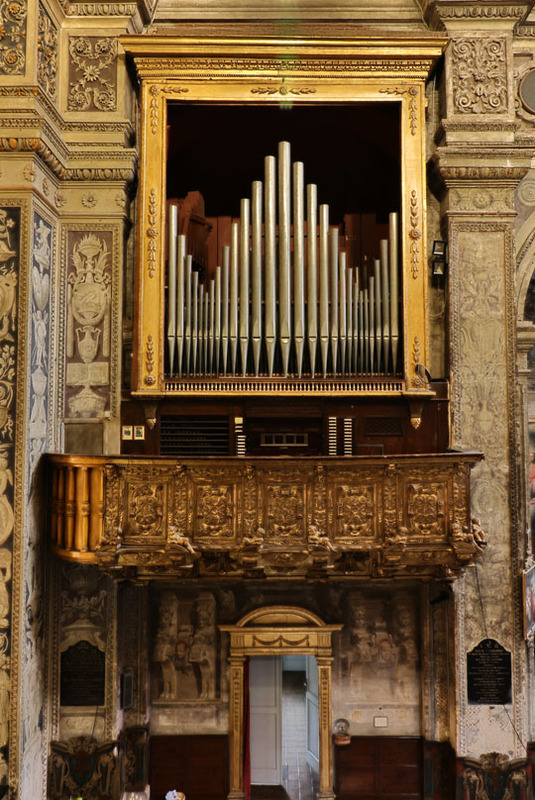 When Padre Davide arrived in Piacenza, the organ of the Basilica was a modest eighteenth century instrument by Cavalletti. Soon thereafter, Padre Davide began contact with the Serassi Brothers to seek an expansion of the old organ. The work was performed in two phases: a first stage in 1825 followed by the inclusion of the second manual in 1838.Selected pipes of Cavalletti were reused into the Organo Eco. Some of the pipes are probably even older, coming from the Giovanni Battista Facchetti who built the very first organ of the church around 1528. In addition to the usual orchestral registers, Padre Davide wanted to include a unique special effect: the bells. These are real bells (an octave) which can be played in different ways, in the manuals or with the pedal. In occasion of the inauguration of the great instrument, Padre Davide wrote 15 organ pieces, published by Ricordi in 1838. The samples are offered in 48kHz/24bit resolution. The multiple releases have three levels: short, mid and long. Hauptwerk v4.2 and higher supported. The sample set is encrypted, the dongle update required for use. The reverb time is ca. 4 seconds. The original compass of the keyboards is 6 octaves. However, the lowest octave of the Grand'Organo is short (semitones missing). The lowest octave of the manual is the Contra-octave, an octave below the usual lowest C on organs. However, the first three keys, CC, DD, EE are mute, only pulling the keys an octave up. Thus, the real sounding compass of the pipes of the Grand'Organo is FF, GG, AA-c4. 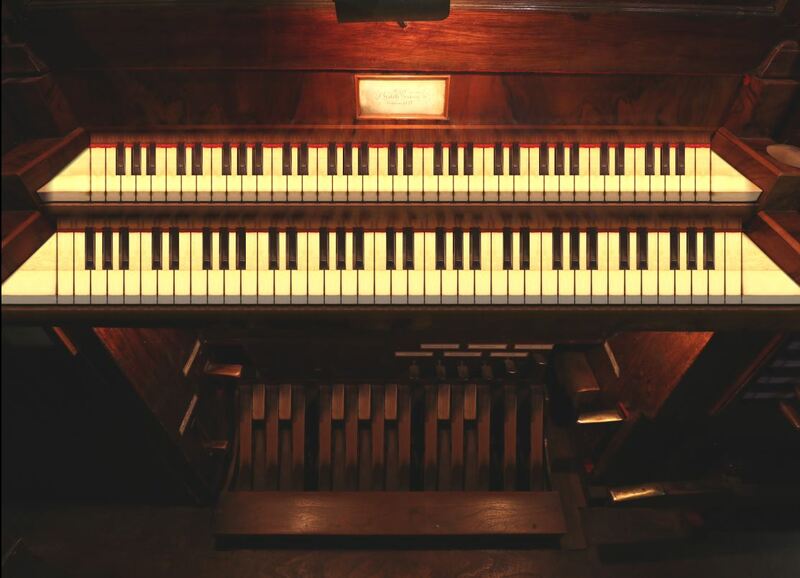 The Organo Eco manual appears having 6 octaves as well, but the Contra-Octave and also the Great-Octave are mute, pulling the keys an octave up. The real compass of the Organo Eco is 4 octaves c0–c4. The original compass of the pedal keyboard is C-e0, but the division consist of 12 pipes only for the lowest octave. The higher keys repeat the pipes from the bottom octave. In addition to that, there are two more pedal keys on the pedalboard of the original instrument. The one appearing to be an f0 serves to pull the Terzamano coupler. And the one appearing to be the g0 serves to pull the Rollante stop. In the Hauptwerk software, this functionality was modelled accordingly. However, using the same logic and to facilitate the use of the virtual organ further, the f#0 key was modelled to pull the Gran Cassa stop. To attach your physical MIDI pedalboard to the virtual pedal of the Piacenza sample set, simply autodetect the keys C-g0 for the pedal MIDI input. All the features of the pedalboard will work just fine. There is no need for separate autodetection of the C-e0 for pedal and f0-g0 for the accessories. The organ includes 9 diatonic bells (semitones missing) and they are played in pedal in this order C-D-E-F-G-A-Bb-B-c0. The bells can be operated also from the middle octave of the lower keyboard using an additional wooden hammers (softer sound). For the bells to be operated, the Campane stop must be on. Where MIDI velocity sensitive keyboard is available, the bell sounds are touch sensitive. Polyphony of 5000 voices recommended for the full suround (3000 pipes minimum). Polyphony of 2000 simultaneous pipes recommended for use of the wet sample set. 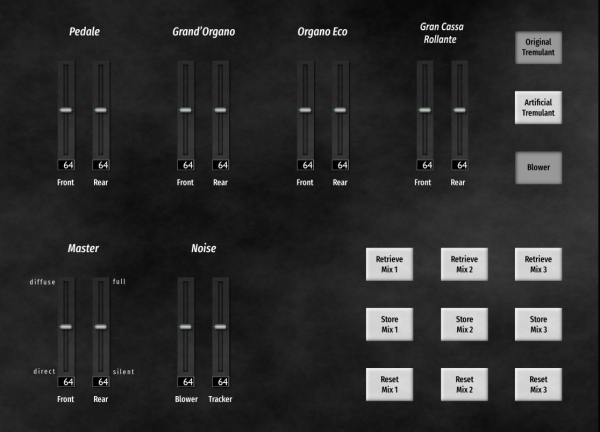 The sample set is offered in the Surround variant (6 channels). In addition to the usual 4-channel surround, there are two more alternative front channels. 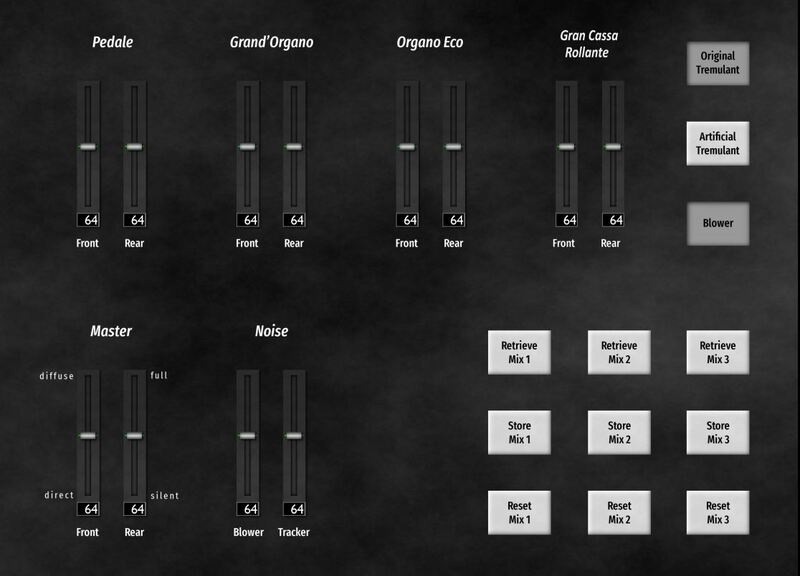 In total, there are 4 front audio channels and 2 rear channels. The two pairs of the front ranks feature two different recording positions: direct (near to the pipes) and diffuse (distant from the instrument). These two pairs of the front ranks can either be mixed together freely to achieve any listening position between the two extremes, or used separately - depending on the prefererences of the user. A dedicated "mixing desk" is available in Hauptwerk to mix the sound to the desired level (see screenshots). Terzamano (II/II 4'), enabled either by pulling a drawstop, or enabled by f0 key of the pedalboard. This is the original functionality and modelled so in Hauptwerk. Rollante (a drum). Operation possible via two switches. Either enabled by pulling a Rollante drawstop, or enabled by g0 key of the pedalboard. This is the original functionality and modelled so also in Hauptwerk. Rollante can be voiced (for example to adjust volume) using the Hauptwerk pipe voicing using the appropriate virtual rank (Rollante, Gran Cassa) and the sliders of the key 17 (F). Always disengage and engage Rollante after each voicing attempt to apply the voicing changes. Voicing is not applied to a sounding pipe in Hauptwerk. Gran Cassa (an orchestra hit) located right of the pedalboard as a foot switch. In addition to that, it can be operated by f#0 key of the pedalboard in Hauptwerk. The pedalboard operation is not original, it is modelled to allow the Gran Cassa operation on those consoles where no proper foot switches are available. Gran Cassa can be voiced using the Hauptwerk pipe voicing using the appropriate virtual rank (Rollante, Gran Cassa) and the sliders of the key 21 (A). Tiratutti (Principal Plenum combination) - foot switch located right of the pedalboard. 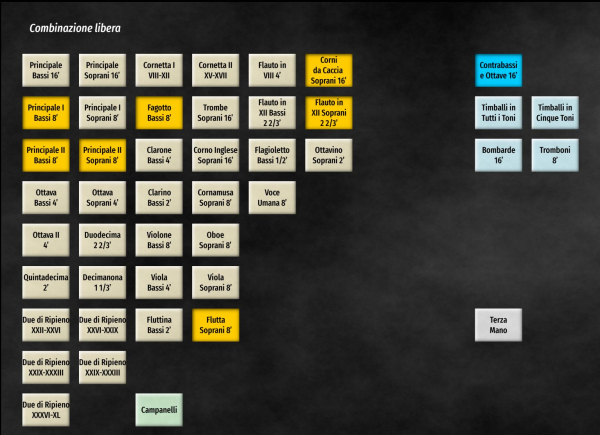 Combinazione libera alla Lombarda - a free combination. 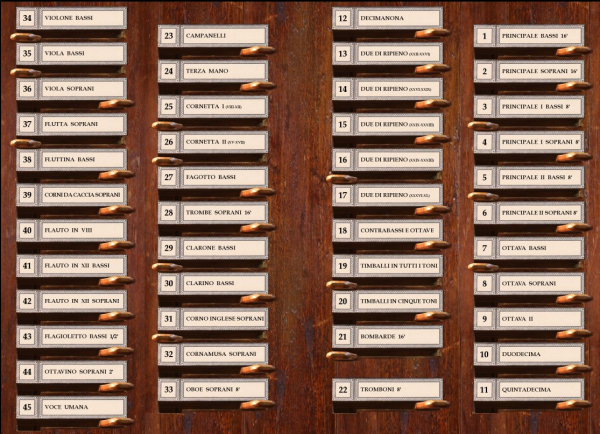 Preselect the stops on the dedicated Hauptwerk screen and activate them all at once by pressing the Combinazione libera button. (The action of Combinazione libera is identical to Hauptwerk Master Reversible Combinations.). 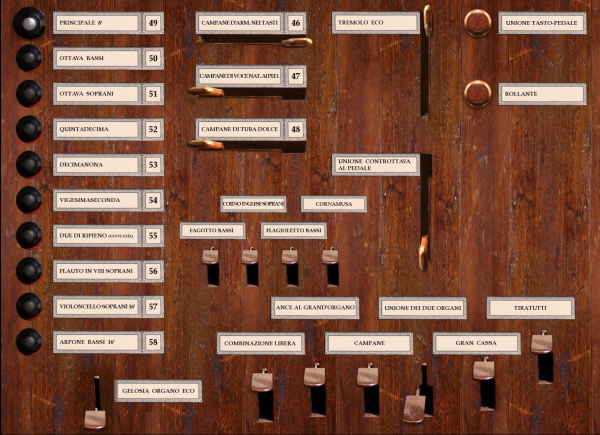 Only stops of the Grand'Organo may be preselected for Combinazione libera. The preselection of a particular stop is visible on the photorealistic tabs by means of a vertical bar on the left edge of the stop labe. 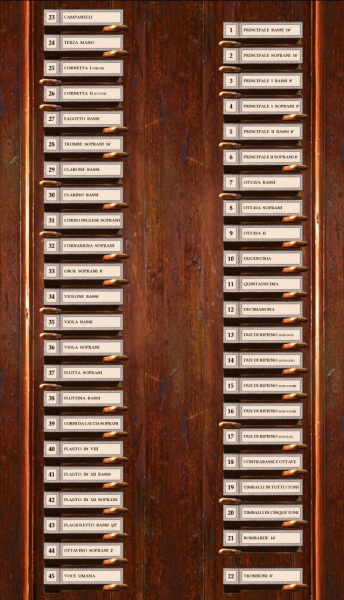 This bar is even clickable to change the combinazione libera directly from the photorealistic tabs in Hauptwerk. Gelosia Organo Eco (swell pedal) located left of the pedalboard. Ance al'Organo Grande (on/off switch for all reeds on manuals) foot switch located left of the pedalboard. Campane switch - enabling the tracker to the bells. When off, the bells do not sound. Foot switches for some stops available in the form of small latch-down foot pedals, sometimes in addition to drawstops for some characteristic stops. 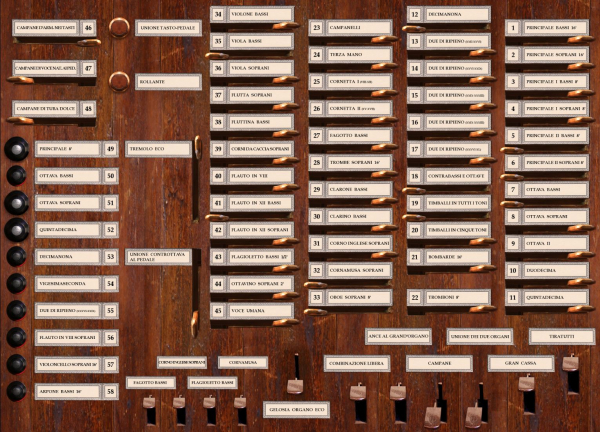 On the real console, these switches are ordered as follows (from left to right): Fagotto bassi, Corno Inglese soprani, Flagioletto bassi, Cornamusa, Campane, Unione dei due Organi, Gran Cassa, Tiratutti. The stop can be engaged/disengaged by mouse click on the stop label or on the stop handle. In addition to that, a stop can be preselected for the combinazione libera by clicking on the left edge of the stop label. The preselection for the combinazione libera is signaled by vertical red bar displayed on the left edge of the stop label. 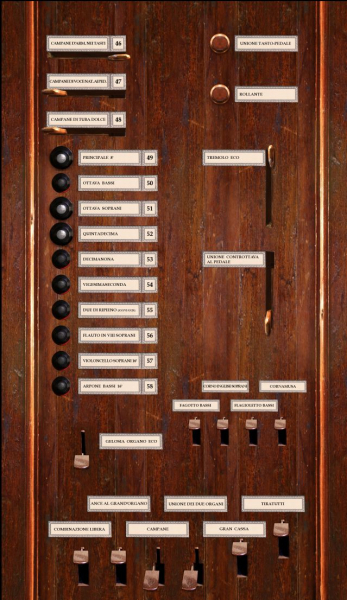 preselect stops of the Gran Organo here and activate/deactivate them all at once later by pressing Combinazione Libera button, available on each stop jamb tab in Hauptwerk. Preselection of a stop for the Combinazione Libera is indicated on the photorealistic jambs by means of a vertical red bar on the left side of the stop label. This red bar is even clickable to allow selection/deselection of the stop for the Combinazione Libera from the photorealistic tabs. 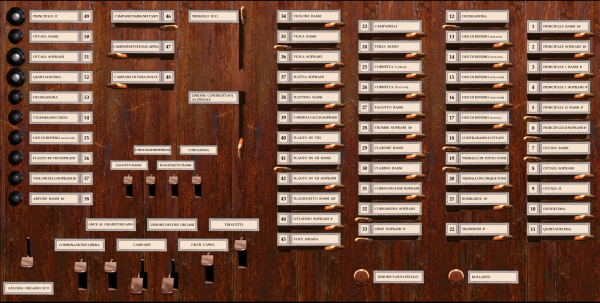 6-channel surround variant of the Italian Romantic virtual organ of the instrument of Padre Davide in Piacenza (Italy). Encrypted, no use without the Hauptwerk software possible. Dongle update required.